Looking forward to the upcoming IAMHIST 2017 XXVII conference on ‘Media History and Violence’ at the University Paris 2 (CARISM) in Paris, France, where I will be presenting current research within the CLARIAH Research Pilot project Narrative Disruption on ‘(Re-)Presenting the Assassination of Pim Fortuyn as a disruptive media event,’ as part of the panel ‘Critical perspectives on historical events and the role of the archive’, and I also will be chairing a conference panel on ‘Public and historical figures’. You can find the full programme here. I co-presented a paper with dr. Sabrina Sauer at the DHBenelux conference hosted by Utrecht University on the 4th of July, titled “Getting the Bigger Picture: An Evaluation of Media Exploratory Search and Narrative Creation”. You can find the PPT on SlideShare and the conference programme here. New publication (in Dutch) is out! 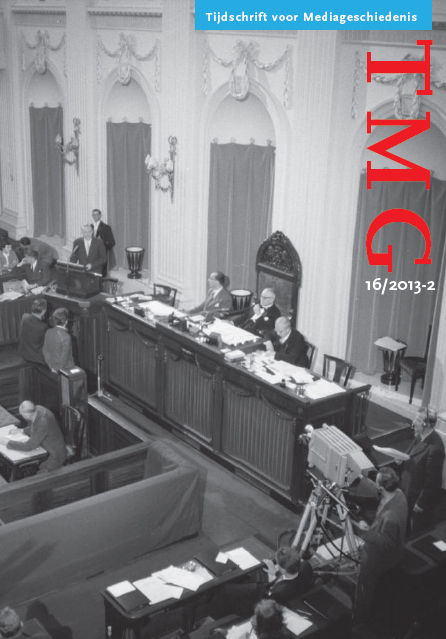 You can find it here in the open access peer reviewed journal Tijdschrift voor Mediageschiedenis (Journal of Media History). In modern society, television is one of the most important media for (re-)presenting the past. In this new article, I focus on the poetics of history on television broadcasts in relation to the manner in which these broadcasts present our past as well as our collective memory. This study rebuts criticism of television as a medium for historical accounts by demonstrating how professionals in the field actively display an extensive knowledge and understanding of the past, provide frameworks for the contextualization of audiovisual materials and depth, and apply and operate specific functions of different representation tools in their productions. To gain insight into the way television producers interact with history, this study combines qualitative textual analysis of the broadcasts and an approach from the field of production studies: diverse in-depth interviews and analysis of internal documents. The case study chosen for this research was Andere Tijden, a history program based on archive material and produced by NTR (formerly known as NPS) and VPRO for the Dutch Broadcast Foundation, from 2000 onwards. The case study demonstrates how television producers’ mediation of history is an important practice in the search for history and memories and the conservation and presentation thereof. The analysis reveals the possibility of more cohesive poetics with regard to history on broadcast television and offers insight into the objectives, strategies and conventions of television producers. Special attention is paid to the more implicit practices of selection and interpretation of material by television producers as curators of the past. These implicit practices are made explicit on a cultural-historical, institutional and textual level. Granted CLARIAH Pilot Research Project: Narrativizing Disruption, a project on how exploratory search can support media researchers to interpret ‘disruptive’ media events as lucid narratives. ‘Disruptive’ media events, such as terrorist attacks or environmental disasters, are difficult to interpret due to an inability to grasp the story. In the media, such events are unwieldy and difficult to interpret due to their spread across platforms, media types and wide coverage – such events make a lot of ‘noise’. This leads to problems for media scholars, who analyse how narratives construct different political, economic or cultural meanings around such events. Offering media scholars the ability to explore and create lucid narratives about media events therefore greatly supports their interpretative work. This project studies how exploratory search can help to understand how ‘disruptive’ events are constructed as narratives across media, and instilled with specific cultural-political meanings. This project specifically approaches this question by using CLARIAH components (DIVE+’s navigation and bookmarking pane) to examine how scholars use and create narratives to understand media events. Academic insights conclude how exploratory search supports narrative generation. Software-specific insights produce recommendations at the entity, interface and user level, provide starting points for media research, and recommendations for auto-generating narratives based on exploratory search practices. This project is a Research Pilot in the context of CLARIAH (Common Lab Research Infrastructure for the Arts and Humanities). New publication is out! You can find it here in the open access peer reviewed journal Media and Communication, written together with drs. Bas Agterberg, curator at the Netherlands Institute for Sound and Vision in Hilversum (http://www.beeldengeluid.nl/en) as part of a special thematic issue on (Not Yet) The End of Television, edited by Milly Buonanno. In this article we reflect on the role of the national archive as an agent of historical knowledge in the convergence era, and how professionals in the television industry are working towards a certain future—rather than end—for the medium based on multi-platform storytelling, as well as multiple screens, distribution channels and streaming platforms. They do so rooted in institutional frameworks where traditional conceptualizations of television still persist. In this context, we reflect on the role of the national television archive as an agent of historical knowledge in the convergence era. Contextualisation and infrastructure function as important preconditions for users of archives to find their way through the enormous amounts of audio-visual material. Specifically, we consider the case of the Netherlands Institute for Sound and Vision, taking a critical stance towards the archive’s practices of contextualisation and preservation of audio-visual footage in the convergence era. To do so, the article considers the impact of online circulation, contextualisation and preservation of audio-visual materials in relation to, first, how media policy complicates the re-use of material, and second, the archive’s use by television professionals and media researchers. This article reflects on the possibilities for and benefits of systematic archiving, developments in web archiving, and accessibility of production and contextual documentation of public broadcasters in the Netherlands. We do so based on an analysis of internal documentation, best practices of archive-based history programmes and their related cross-media practices, as well as media policy documentation. We consider how audio-visual archives should deal with the shift towards multi-platform productions, and argue for both a more systematic archiving of production and contextual documentation in the Netherlands, and for media researchers who draw upon archival resources to show a greater awareness of an archive’s history. In the digital age, even more people are part of the archive’s processes of selection and aggregation, affecting how the past is preserved through audio-visual images.